Here’s a sneak peak at the server / comms room setup I have at home. It evolves over time with new servers being put in as part of my personal test lab, but every once in a while I shut everything down, pull everything out, including power/network cables and redeploy. 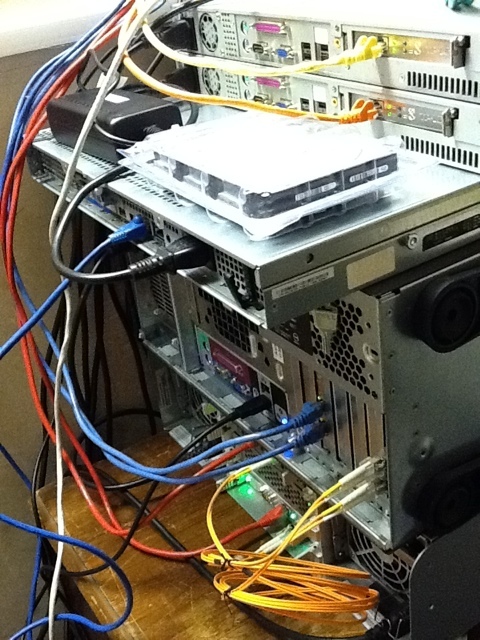 An evolving server room will always get messy over time, this is inevitable. 4 bay USB2 drobo unit, currently running 2x 2Tb and 2x 1Tb drives. It’s a first generation drobo, thus only supports USB2, and max 2Tb drives, hopefully drobo will release firmware to support larger drives in the future. Once 2Tb drives drop below the £50 mark per drive (inc vat and delivery), or when I run out of space, I’ll replace the 2x 1Tb drives. This unit holds all of my TV episodes and shows, hence it’s name. 24 port gigabit switch, not much more I can say, it’s managed and very good in a “non ISP” environment. Not sure if I’d use one in the data centre though, other than perhaps as a storage network switch (supports multiple bonded port groups, and jumbo frames, with a 10Gpbs backplane). Netgear ReadyNAS, with 4x 250Gb drives, holds all of my music. The main reason I still use the ReadyNAS is that it has squeezebox server built in as part of it’s base operating system. I have two jogglers (little openpeak photo frame tablet things) around the house, running jolicloud, with squeezecentre on them. So this setup for music “just works”, which is all I care about; for music anyway, throughput isn’t critical. If I needed to I could bond the network interfaces, but there’s really no need for that! 1Tb Lacie Etherdisk (4x 250Gb) running Debian, this spends most of it’s time powered down, I only fire it up when I need it. It’s on a separate storage VLAN, and I use it as an NFS based datastore when I need to move virtual machines between different vmware ESXi servers. Dell Poweredge SC1425, my primary vmware ESXi server, running various things, perhaps I’ll do another post about the virtual machines at some point. There’s usually another SC1425 (ESXi) called Optimus underneath this server, but at the time this picture was taken Optimus is in the office. 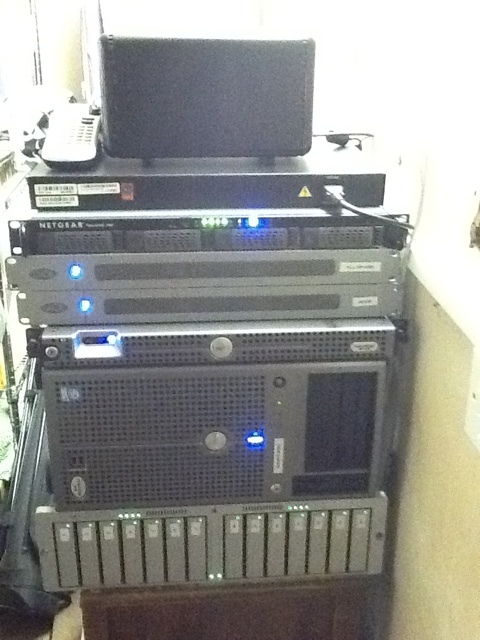 Dell Poweredge 1800, my primary storage control server, and the central point for media sharing across the network. It also has some internal storage, about 4Tb worth, used when I need to move large amounts of data around. The Xserve RAID is running fibre channel to the storage server (Sideswipe), which has bonded gigabit onto the network (bonded ports on the switch too obviously). There are some other machines missing in these pics, all that are used for various virtualisation testing etc, but they are currently with clients doing proof on concept delivery, or being borrowed by friends. In total I probably have around 24Tb of storage running in this setup, all of which is backed up on zovo, who provide unlimited storage online backup. With everything running, this setup uses just under 4 amps (thanks to power metering on the APC power bar). Anyway, hope this has been informative, why not comment and tell me about your setup?